Fashion Week Editorial by Marc Piercey. By the time this review is posted, the runways have been packed up and stored away in a warehouse. The lighting has been taken down, and the fancy, all-white decor has been wrapped and stored away. Heritage Court, the venue on the CNE grounds that was home to Toronto’s fashion week, went back to being a vacant lot, then set up again for the Canada Green Building Council event happening this week. It’s almost hard to believe that fashion week has come and gone already. Just a faint memory of sleepless nights editing photos with Richard, and endless hours spent clicking away at the keyboard to write reviews, is also a sobering reminder of the whirlwind week that happens for bloggers every March and October. I’m fully rested now, the dark circles under my eyes have faded, albeit just slightly. I sit here drinking another cup of coffee at the computer desk in my mothers apartment (I’m staying here and feeding her fish while she treks through Italy for the month). I’m sitting here writing a review of fashion week, as I saw it, and remember it. Another review in the seemingly endless reviews that have popped up over the past week or so. 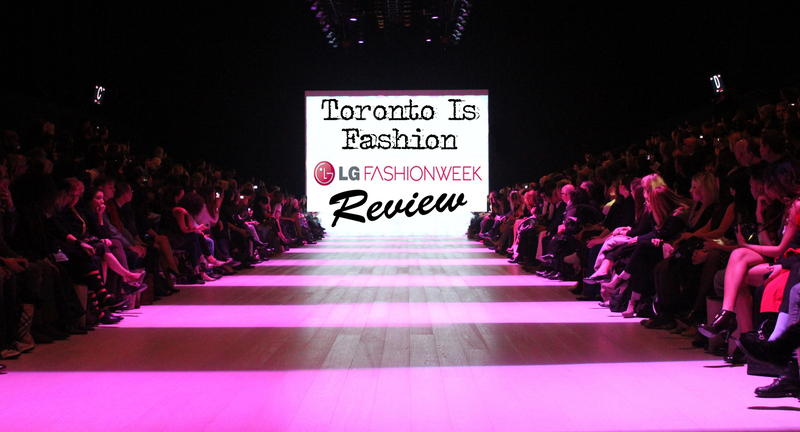 This was my fourth season attending Toronto’s fashion week and, like many who attend the week long fashion explosion, I come for the experience itself. Getting the chance to mingle before shows, meeting new faces and industry insiders, as well as getting to catch up with old acquaintances I don’t get to see on a more regular basis. Inside the the venue there were a few decor changes. This year saw more sponsorship visibility, with a retail set-up by the entrance, booths for Special K and Rowenta. L’oreal chruned out different styles and looks from their on-site studio. Even Ken and Barbie had new digs that featured the dolls outfitted by different Canadian designers and live Ken ‘dolls’ to snap a photo with. Even media members received swanky new digs with bigger tables, more lighting and an open concept. In the middle of things, literally, was a giant white VIP area that was encircled by white netting that was hanging from the tall ceiling. This section had a very ‘Gossip Girl’ feeling to it, as people tried to sneak a peak past the suited security guard watching over the only entrance. It was a nice touch at first, but seemed intrusive as the week wore on. I understand the need for having a special VIP area, but the white netting looked a little like they were protecting themselves from malaria-carrying mosquitoes. The cafe had a trendy look to it, with glass tubes marking the border between cafe and venue, while white tables and large chandeliers to match, finished the decor touches. The menu was a bit on the pricey side for this blogger, and many complained the price they paid didn’t match their taste-bud expectations. 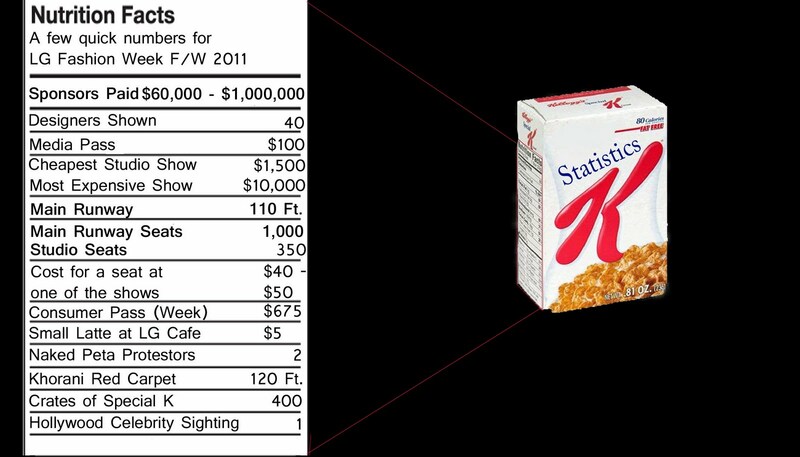 With a secluded venue, the options for food around LG Fashion Week were scarce and many opted to nibble on strawberry Special K bars being given out at their booth. Needless to say, by the 5th day of snacking on the bars I never wanted to see one ever again! Not even Tony the Tiger himself could convince me to have another, regardless of how ‘grrrrrreeat!’ he says they are. All of these things, the hunger, the VIP seclusion, and any other annoyances couldn’t deter my excitement for the real reason of why I was at LG Fashion Week in the first place. The fashion! This year we saw new designers sharing the runway with the established ones and between the main runway and the studio, 40 designers in total got the chance to show off their designs. Gone were the studded shoulder pads and harsh geometric cuts, making way for a more feminine and classic look. This season we noticed a large focus on a vintage inspired pieces. The design duo behind IZMA took cues from the 1920’s and some ’70’s to create a smoldering hot Parisian look. Pink Tartan showed a collection that played up the femininity while borrowing trends from the 1930’s war time era. Trendy rug designers Korhani, who is also a sponsor for LG Fashion Week and provided the red carpet outside the venue, put on a unique show that played off the 1950’s poodle skirt revolution. The much anticipated shows for Joe Fresh and Jay Manuel, although different in design and overall looks, both used splashes of colour for the fall season. Amanda Lew Kee had some pieces that were reminiscent of the musical Chicago that would have Velma Kelly clamoring to buy. The infusion of vintage looking pieces, military details here and there, and brightly accessorized styling means you’d better hit your grandmothers closet early to be on trend for fall. Although I couldn’t imagine being in charge of putting on Canada’s largest fashion show, the second largest in North America, there were a few things I was surprised about this season. With all the months of planning and pouring over small details in the lead up to fashion week, these are a few things I feel were over looked in the process. 1) Earth Hour – The event that used to be the ‘it’ event for simple energy conservation in this city just a few years ago, sadly went by this year with little notice in Toronto. In fact, it was the most disappointing Earth Hour Toronto has ever seen, with just under a 5 per cent decrease in energy consumption. Earth Hour, which asks everyone to turn of lights and non-essential items, took place this year between 8:30-9:30pm on March 28th. It was also the opening night of LG Fashion Week. The opportunity given to fashion week’s organizers to tie in something around this globally recognized event seemed to be completely overlooked. This was a disappointment for me, as surely there are enough artistically talented people in this city that the organizers could have partnered with to develop something, anything, that would have had people talking. As Earth Hour has grown from it’s roots in Australia, it has become a global effort with about 130 countries and millions of people participating, which leaves news outlets all over the world looking for news, events and interesting pictures to bring their viewers. Had we created something bold and unique, it could have put ‘LG Fashion Week’ on the lips of tv news anchors across the globe, even if it just for one day. 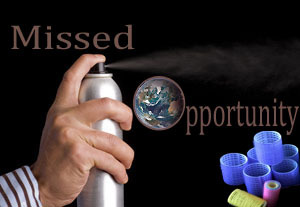 Another disappointment surrounding the fact that Earth Hour was ignored was the chance that the FDCC had to tie-in the Toronto fashion scene with a political statement of energy conservatism. It’s not a groundbreaking idea I know, as this wouldn’t be the first time the fashion industry used its influence to bolster a cause for the greater good. LG Fashion Week as a whole could have been seen a passionate, caring and cutting-edge establishment. Robin Kay, the FDCC’s president and mother of Toronto’s fashion week, has previously touted her previous personal accomplishments and goals in environmentalism before she joined the FDCC. My only question is, why did she stop? 2- The Runway: The cushioned, individual chairs that seated Toronto’s front-row-worthy audience were no more. This year, it didn’t matter how much those Louboutin’s cost, everybody was sitting bleacher style. Although the metal seating is a bit hard on the eye, and other body parts, its not really a concern of mine as I mostly work the ‘photographers pit.’ One of the focal points of the venue, and possibly one of the most important mechanisms of any fashion show, is the runway itself. For me I look at runway as something that should be beautiful, a showcase for the designer creations that are walking on it. It shouldn’t be something that I can pick out at Home Depot and install as my living room floor. The tired looking white-washed hardwood runway we have certainly needs to go. When I look at pictures from previous fashion seasons in Paris, New York, Milan and London, I can’t help but be envious of their runways and set-ups. Something that wasn’t even around a few years ago, has now become a staple to just about everyone person at a show. I’m talking of course about Twitter. Admit it, you’ve tweeted once or twice during a show or event to express your opinion about a design or simply to let your followers know where and what you’re doing at that exact moment. This social media format has Blackberry and iPhone keyboards clicking through out many shows. When I look up from the photographers area at the end of the runway, I usually see glowing faces in the audience illuminated by their cellphones. Like any social platform, Twitter was the outlet for rumours surrounding the shows this season including a possible last minute cancellation by David Dixon and the possibility of Gwen Stefani or Tyra Banks making an appearance at the Jay Manuel show. Of course these rumours didn’t pan out, but we did manage to get Samuel L. Jackson in the seats for the Klaxton Howl show. Twitter has turned everyone into a ‘Fashion Television’ reporter, live on the scene, in 140 characters or less. Even Richard and I couldn’t help tweet this season as we were chosen to be ‘live tweeters’ for Global Tv. If you have a twitter account, be sure to follow us to stay up to date on blog posts.